Does registration under Udyog Aadhaar help in getting loans? Ease of doing business and simplification in regulatory procedures was an all-time requirement of the business sector, especially for MSMEs. Also, obtaining adequate finance for running their business activities was among their priority issues. Thus, the introduction of Udyog Aadhaar Memorandum was the biggest reform for the industry which helped them raise easy benefits of development and financial schemes of government. How to obtain Udyog Aadhaar? Udyog Aadhar Memorandum is a single paged MSME business recognition certificate issued by Ministry of Micro, Small and Medium enterprises for ensuring delivery of benefit of schemes introduced by the government for MSMEs. To obtain Udyog Aadhar online one has to file an application providing details of the business and follow a short procedure stated here. Acquisition, construction, purchase of land, factory or business premises. Purchase of implements, machinery, furniture, equipment, etc. The launch of new product range, marketing advertising, warehouse building or any other eligible purpose of a loan. 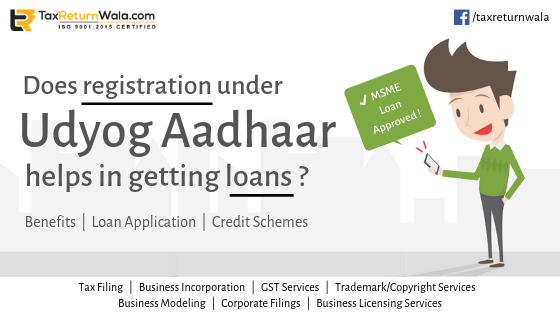 Checking eligibility for the scheme: The ministry provides certain parameters for registered MSME entities to avail loans with Udyog Aadhaar from institutions and registered banks under respective schemes of government. To check eligibility for MSME Loan for your business online: Email us at info@taxreturnwala.com. Applying for loan: Only registered entities as MSMEs can avail loans under specified schemes. Udyog Aadhar is used as an identity proof of business for applying for such loans. Thus, while filling the specific form or application one can use the 12 digit Udyog Aadhaar number to apply for MSME loan online. – The exemption under direct tax laws. – Ease in compliances of filling trademark, patents copyright applications. – Assistance in export procedures and obtaining technology upgrades from the government. – Concessions in payment of production necessities, promotion expenditure and electricity bills obtained from the government. – Obtaining easy subsidies on supplies etc. Note: It is necessary to obtain Udyog Aadhaar Memorandum to obtain loans under various schemes and offers of government and other institutions. Apply and quicken your Udyog Aadhaar application with our business compliance expert online.